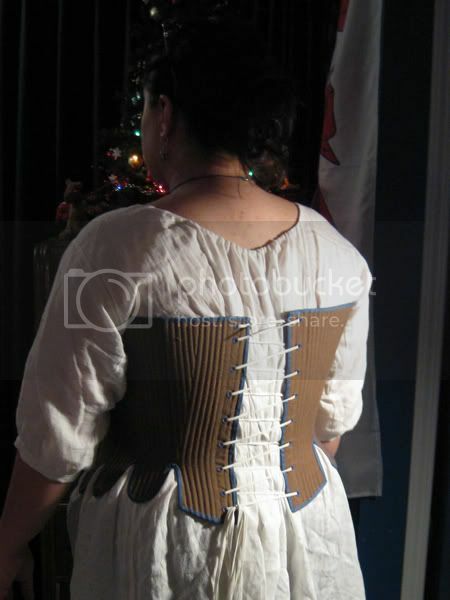 My first summer working at Fort Michilimackinac, I made a pair of strapless, lightly-boned working stays which served me very well for several years. After two full summers of hard use, plus multitudinous other extended wearings, they pretty much started to disintegrate right off my body. My goal here was to replace them with a sturdy, comfortable pair of stays in which I could comfortably move, bend, and work. I also wanted them to be more historically accurate. To that end, I pulled out Costume Close-Up and Fitting and Proper and sat down to re-draft my basic stays block (again). The stays are fully boned with reed that I "borrowed" from Gwendolyn Basala. I believe they're 2.5mm; I used two in each quarter-inch channel. I cheated and used spring steel on either side of the lacing eyelets, partly because I had it lying around and partly because I don't trust the reed not to snap when I yank on my laces. I used two layers of twill for foundation, with an outer layer of a nice tobacco-brown linen/cotton blend from Field's. The channels are machine-stitched with soldier blue heavy-duty thread; the seams and eyelets are sewn with the same. I hand-bound the eyelets without being really sure why, other than that it's period. By the time I got done with that, I had major calluses on the first three fingers of my right hand and had to sew the pieces together by machine because it hurt to badly to try and force a needle through six layers of fabric. I was going to use leather for the binding, on account of it's overwhelmingly period and has to be tougher than the pre-made stuff available at most major craft stores. Then it turned out that I couldn't find binding in a color of which I approved, so I wound up using the packaged stuff anyway. Also as a point of interest, the chemise I'm wearing in the first chemise I've actually ever made. 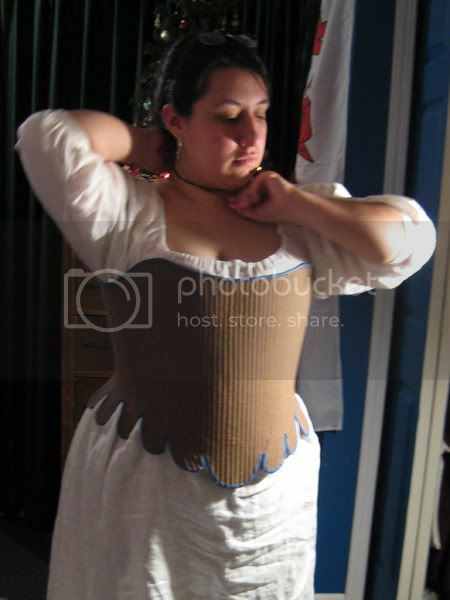 It doesn't really warrant its own page, but seeing as I've been making historical costumes for a number of years now and, up until December of 2008*, had yet to make myself a chemise, I think it at least deserves an honorable mention. (I don't count the two camicias for prior Venetian costumes, as they're not usable for anything but the Venetian costumes, which are Not My Period.) I used Fabrics-Store's handkerchief weight linen, of which I bought ten yards when it was on sale. It's a great weight and look forward to using it again.